If you need a colorful addition to a flower bed that gets hot afternoon sun, you might want to try growing Ixia bulbs. Pronounced Ik-see-uh, the plants are commonly called wand flowers, cornflowers or African corn lily plants. Ixia wand flower thrives in the hottest and sunniest areas of the garden, producing attractive, sword-shaped foliage and masses of dainty, star-shaped flowers on wiry stems. When growing Ixia bulbs, actually corms, you may be happily surprised to find they are shaped like chocolate kisses. Ixia plant info says to plant the corms 3 to 5 inches deep and 3 inches apart into fertile, well-draining soil. Southern gardeners should plant them in fall, while those in USDA gardening zones 4 and 5 should plant in spring. Care of wand flowers includes a heavy layer of mulch for fall planted bulbs in zones 6 and 7. A South African native, Ixia plant info indicates African corn lily plants are short-lived perennials and may perform as annuals, not returning after a hard winter. However, Ixia wand flower corms are readily available in garden centers and big box stores and are usually not expensive, so replanting is not much of a chore. You’ll find it is worth the effort when the delicate and colorful blooms appear in the garden. The Ixia wand flower blooms in late spring in the south, while the colorful flowers appear in summer in northern areas. 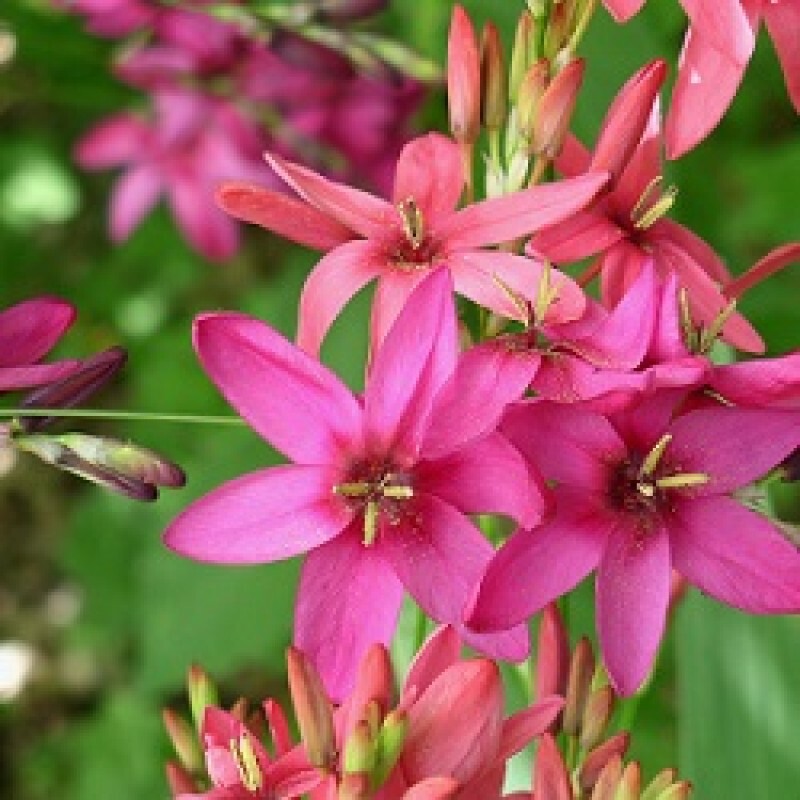 When growing Ixia bulbs, you may wish to lift them in fall and store them for the winter. In colder areas, plant wand flowers in large containers and sink them into the ground. When frost approaches, simply lift the pot and store in an area where temperatures remain at 68-77°F. Damage to the corms starts when outdoor temperatures fall below 28 degrees F.
Ixia wand flower blooms in a multitude of colors, depending on the cultivar planted. Turquoise green blooms with purple to almost black centers, called eyes, bloom on the cultivar Ixia viridiflora. Panorama is white with purplish red eyes, while Hogarth features cream colored blooms with a red-purple center. The cultivar Marquette has yellow tips with purple black centers. Care of wand flowers is simple. Keep the soil moist during periods of growth. Mulch heavily if you have cold winters and do not lift the corms. Companion plants for growing Ixia bulbs may include dianthus, Stokes aster and spring blooming annuals.